All language schools are not equal, nor is finding the best place for you as simple as reviewing a few schools online and then picking one. 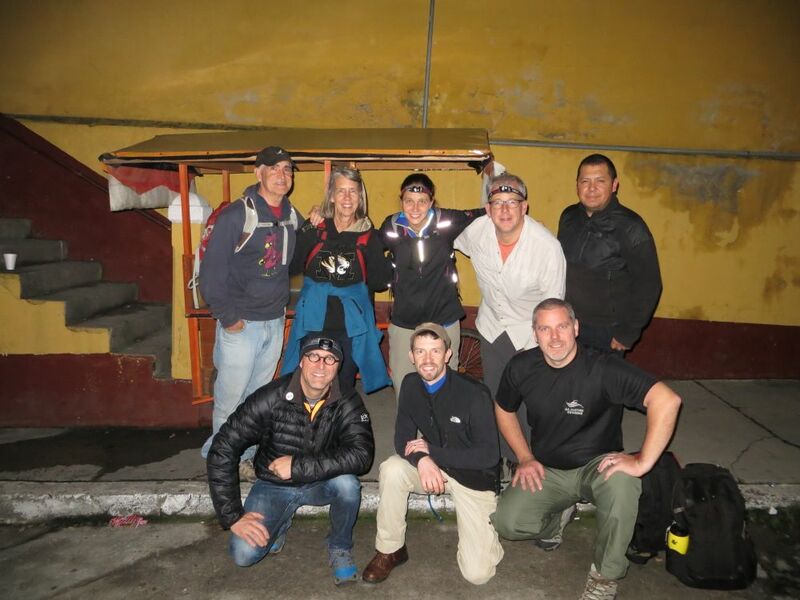 I’ve been there and there’s a lot of info out there, but making a decision of where my wife and I were to spend our next six months or so as we studied Spanish was kind of like diving into a river after talking to others who swam there before. We hoped to hit the right spot and not drown or hit any rocks in the process. When you’re looking for a place to learn Spanish there are many elements to take in to account: Location, Cost, Perks, Experience and more. First of all there is the consideration of countries. There are lots of Spanish Language schools in Spain, Chile, Costa Rica, Guatemala, and probably every Latin American country on the map. Here’s a list of 90 schools in 14 countries. 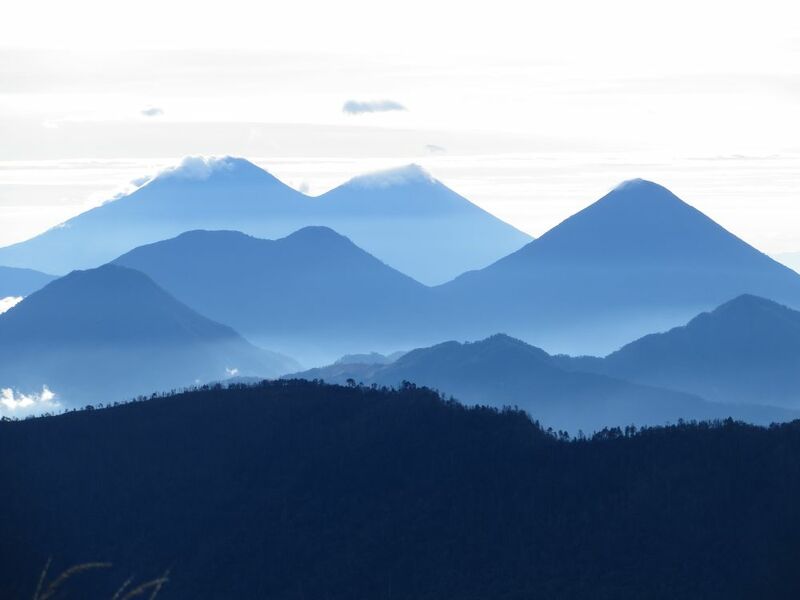 We wanted to learn Latin America’s version of Spanish and we have plans to be in Guatemala for a while so we chose to study in the beautiful highlands of Guatemala. 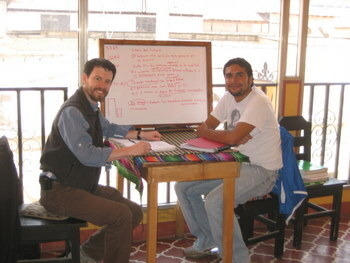 Once the country was settled, it became a matter of what city: the main choices are: Antigua, Xela / Quetzaltenango, or Panajchel but about 10 cities offer language studies in Guatemala. Private tutors can be found in other places, but you’ll need some sort of contact to connect with them since there’s no central way to find them. Cafe Baviera is a quiet cafe/restaurant with several locations to choose from in Xela / Quetzaltenango, Guatemala. Known for it’s European feel, cafe, and casual feel, Baviera is also the home of some great sandwiches, specialty coffee drinks and some very smooth banana shakes. Their cakes and desserts are also very refreshing to he traveler’s taste buds. Often frequented by expatriates and featured in Lonely Planet, Baviera I is a great place to quietly study or strike up a conversation or discuss this city’s unique history and stories. Although, you have to be careful where you sit. If you want to study your Spanish, the upper couches are a bit more private than the lower couches. We were sitting on the lower couches when we ended up in lengthy English conversations with other expatriates when we were really there to study. 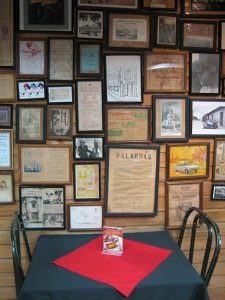 The downtown location (in Zona 1) has an eclectic feel with walls plastered with framed photos, posters and more depicting Guatemalan history and international imagery. Decorations also include many old memoribilia, cameras, metal banks, car parts and nostalgic radios. Baviera Cafe II (in Zona 3) has a beautiful courtyard with seating for guests. We enjoyed taking guests to this location. It doesn’t look like much on the outside, but like many buildings in Guatemala, the exterior seldom hints at the treasure within. 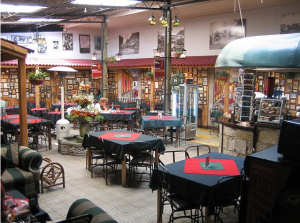 This location was converted from a house into a restaurant. The conversion really turned out nice. Prices for sandwiches, crepes and salads are in the Q20-30 range and my favorite shake is Q20. 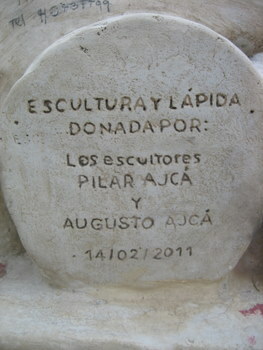 The grave stone of Vanushka Cardena Barajas, the young gypsy who died of a broken heart. Here’s the story of Vanushka Cardena Barajas roughly based on the tale told to me by a Spanish-speaking guide at the cemetery in Quetzaltenango, Guatemala, and other sources I could find. Legend says it happened about 1927 though details are not verified. 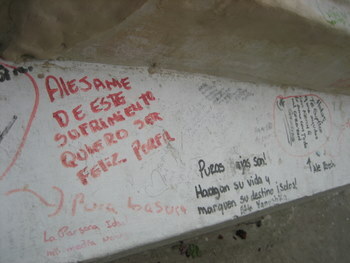 Recently, the Guatemalan songwriter Alvaro Aguilar wrote a song dedicated to Vanushka. Vanushka was a young Roma/Gypsy woman when she moved with her family from eastern Europe (possibly Hungary) to Guatemala. They traveled the country performing in a circus to make money and because entertainment was the trade they knew. When they were in Quetzaltenango (also called Xela) they settled in and promoted their circus. 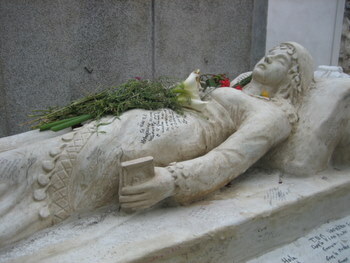 A statue of Vanushka lies on her tomb in the El Calvario Cemetery in Quetzaltenango, Guatemala. One evening a young man, who we will call Javier for his name has not survived the years, arrived at the circus tent. Javier was from a wealthy family, (some say he was the son of a Spanish ambassador) and that night he visited the circus with some of his friends. He was handsome and something about the way he carried himself among his peers caught the eye of one of the performers, Vanushka. She was observing the crowd from off stage until it came time to take her spot in the ring. That night Vanushka’s performance was better than ever and her beauty and skill caught the eyes of everyone in the crowd, but no one was so captured as the wealthy young man. After the performance, the Javier saw Vanushka leave from a side entrance and he rushed away from his confused friends as he made his way around the tent to try and speak with this beautiful girl. He did catch up with her and they talked the entire night as they walked around and around the circus tent. As dawn broke they said farewell and promised to see each other at the performance that night. This continued for several days and at the end of the week, they had confessed their love for each other and were trying to figure out how to share their new-found love with their families. Her family had already seen the blossom of love on her face as she watched the stands for this striking young man and no one could miss seeing them walking hand in hand as they circled the tent each night. 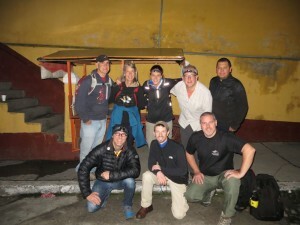 The fourth night of the performance in Xela, Javier was joined by his father as he went to the circus. Javier’s family had started to suspect that something was happening since their son was hardly sleeping and had that dreamy look in his eye of a lovestruck youth. It didn’t take Javier’s father long to realize that this match would never work, for their families were so different and came from such different backgrounds and there were so many wonderful plans he had for his son. Father and mother tried to talk Javier out of love, but nothing seemed to work. They reminded him of his education, his station in life and his responsiblities that just would not fit when combined with this wandering daughter of a circus master. Despite their attempts at reason, Javier was convinced that Vanushka was the one for him. Out of desperation, Javier was ordered to leave for Spain the next day to spend four years in university there. 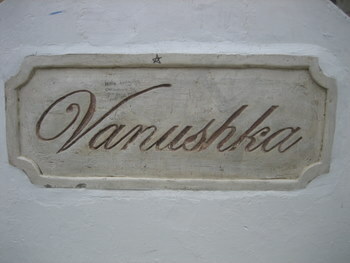 The Vanushka tomb showing Vanushka holding a photo of her beau. That night Javier wept as he bade Vanushka farewell. She was heartbroken and clung to him as he was torn from her arms by his valet whom his parents had demanded he take with him. That morning he left in a carriage for the coast to catch a ship to Spain for what he imagined would be the worst four years of his life. Sadly, he was only slightly incorrect. For days Vanushka wept in her tent. Her mother could not console her and even her father’s demands were not enough to get her to eat. Slowly, the beautiful Vanushka became strained and pale. One night only a few weeks after Javier left. Vanushka slipped into a troubled sleep that slowly calmed to a deathly pale. As her mother kept watch by her bedside, Vanushka gave a shudder and weak sob as a tear streamed down her pale cheek. Then her hand went limp and she breathed the long shallow sigh of death from a broken heart. The entire gypsy family wept for Vanushka as they carried her lace draped casket through the streets and to the Calvario Cemetery where they laid her in a tomb. People still write on Vanushka's tomb hoping to have their distant loved one restored. Although people debate whether she died because of the distance between them or because they were kept apart by their families, most people in Xela agree that she died of a broken heart. the story of Vanushka’s sorrow and went to her tomb to weep for she had a similar separation between the man she loved and herself. Soon, they were reunited and the tale grew into one that says that one who visits Vanushka’s tomb and leaves flowers or writes a note on the tomb will be reunited with their love. While there is only a little evidence for Vanushka’s story here, there is clear evidence that many people still visit Vanushka’s tomb and leave both flowers and notes. 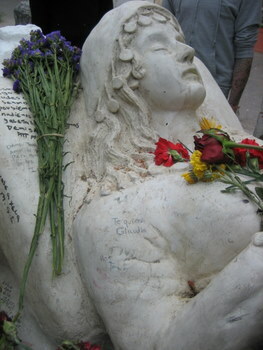 In fact, in February 2011, a new statue was placed on her previously simple tomb depicting the lovesick girl in repose with a photo of her beau in her hand. If you want to visit Vanushka’s tomb for yourself, you can find it when you enter the Quetzaltenango Calvario cemetery. Once you get through the gate, the tomb is just off the main path to the left of the entrance. It’s kind of tucked behind the first couple of large tombs, but if you walk around them you’ll find it. If you have difficulty, ask around and someone will surely help you!